There are many different behaviors that fall within the classification of distracted driving, including texting and driving, which is very well-known, and using a cell phone, with or without a hands-free device. However, many other behaviors lead to a loss of focus on the road, which may have devastating consequences for the driver, passengers, and third-parties outside the vehicle of the distracted driver. It is important to understand what actions fall within the classification of distracted driving, but in order to do that, a person has to understand what it means to be distracted. There are three types of distraction: taking one’s focus off the road, taking one’s eyes off the road, and taking one’s hands off the wheel. Each of these may lead to a loss of control of the vehicle and a serious accident. Taking one’s focus off the road (cognitive) – This also is a very dangerous situation. Many people have found themselves pulling into the driveway of their home without a clear recollection of how they got home. In most cases, there are no serious impacts from the loss of focus, but if a dangerous situation arose during the time when the person was on auto-pilot, it may have been impossible to react in time. Other scenarios can lead to loss of focus, including emotional highs and lows, fatigued driving, day dreaming, and even talking to passengers in the car. Many types of distracted driving involve and overlap of two or three kinds of loss of focus. One of the reasons that texting is viewed as such a dangerous activity and has led to so many rules, regulations, and public safety campaigns is that texting actually involves all three types of lost focus. A person must have the telephone physically in his or her hand, often involving the other had for the actual texting, he must take his eyes off the road in order to focus on the screen, and he is directing mental capacity towards interpreting the incoming message and composing the outgoing one, so the danger is magnified tremendously. 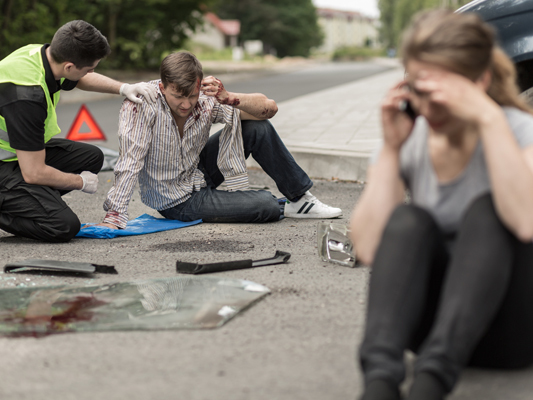 The statistics surrounding distracted driving accidents is sobering. According to statistics compiled by the National Highway Traffic Safety Administration (NHTSA), 18 percent of fatal accidents in 2012 were caused by distracted driving, resulting in more than 3,300 deaths. An additional 421,000 people were injured. A study done by the Virginia Tech Transportation Institute has indicated that drivers who were texting and driving were 23 times more likely to be involved in an accident than drivers who were not involved in texting. According the NHTSA, more than ten percent of drivers who were under the age of 20 years at the time of the accident were distracted at the time of a fatal crash. For more information about the impact of distracted driving on severe accidents resulting in injuries and fatalities, visit the Federal Communications Commission’s website. For most people, using a cell phone has become a necessary daily activity, whether for work or staying in touch with friends and family. There have been numerous public safety campaigns and most states have passed laws limiting a driver’s ability to operate a vehicle while using a cell phone without a hands-free device. In Mississippi, the law has just been changed to ban texting and driving or using social media while driving, but the state does still permit drivers to use a handheld cell phone while operating a vehicle. It is important for drivers to understand that there are two consequences of using a cell phone. The first is that a person has removed one of his or her hands from the wheel, leading to less control over the vehicle. The second issue is that having a conversation removes focus from the road, which also occurs with the use of a hands-free device. In addition, the act of reaching for a ringing cell phone increases the risk of being involved in an accident. It is advisable to let people know that a driver’s cell phone is going to be off during the journey and then actually turn the phone off. Placing it out of reach also may limit the temptation to place or answer a call. There is a national movement to stop drivers from texting and driving. This effort has resulted in national distracted driving summits and the outright ban of texting and cell phone use for commercial drivers subject to federal regulation, which includes long-haul truckers. However, texting and driving remains a factor in many crashes across Mississippi and the rest of the country. Various studies have been done to analyze how long a person can safely take his eyes off the road, with the surprising results being only two seconds. An average text takes at least five seconds to send, meaning that it is impossible to ever text while still maintaining control over the vehicle. Texting has the greatest risk of leading to a distracted driving accident, significantly more than using a cell phone, reaching for a device, or engaging with passengers in the vehicle. Although there is a lot of focus on teenagers who text and drive, the fact is that many adult drivers also engage in this dangerous activity. It is important for everyone to put their phone away before operating a vehicle. Many young drivers learn that it is okay to text and drive by watching their parents and other adult drivers engage in this very behavior. Teenagers already are at greater risk of getting into an accident because they are novice drivers without the time and experience operating a vehicle to react effectively in many dangerous situations, or even when road conditions change unexpectedly or weather becomes a factor. Unfortunately, this group of drivers also engages in many different risky behaviors, which compound the risk of getting into a serious accident. Texting is one of the most common forms of distracted driving in which teenagers engage. According to a recent study by the Transportation Research Institute, University of Michigan (UMTRI), 25 percent of teenagers receive and respond to one or more texts every time they get behind the wheel of a vehicle. As more and more parents are becoming aware of the dangers that their teenage children face when getting behind the wheel of a vehicle and grabbing their cell phones to send and receive messages or getting into a car operated by a teenage driver who is texting, or engaging in other types of dangerous behaviors, there is a movement to take proactive steps to prevent serious, and often fatal, accidents. One of the ways this is being done is through a series of promises that a teenager makes to his or her parents concerning an effort to avoid distracted driving. The next page contains a pledge to be signed by the teenage driver, as well as his or her parents or guardians. The act of entering into this agreement has been shown to increase young drivers’ awareness of dangerous activities.